Brief: LG Shaker had recently launched a twitter account which suffered from a low followers count and was devoid of any Twitter content. The Social Clinic were commissioned to re-launch the Twitter account, increase its number of followers and generate higher engagement rates. Delivery: October was a busy month in Saudi as it prepared to welcome millions of pilgrims for Hajj season as well as prepare its children to recommence school after the summer holidays. As thus, we decided to approach the brief by taking advantage of these two events and their infamous high rates of air-borne related illnesses by launching an informational campaign regarding one of LG Shaker’s most important selling points; Air Purification. 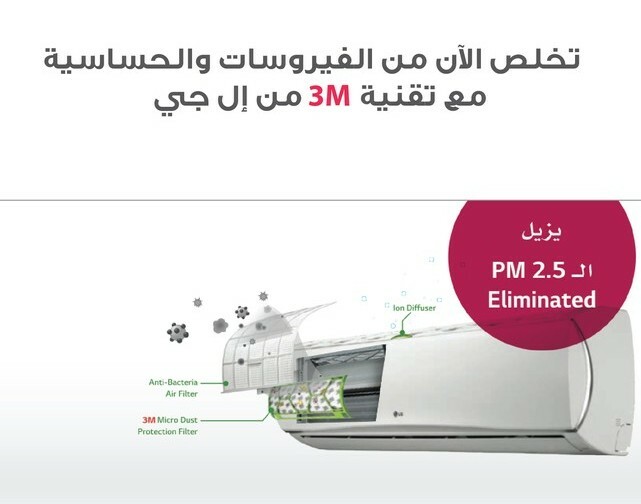 Based on these insights we proposed a promotional Tweets campaign to highlight LG’s Plasmaster Technology and Indoor Air Purification. Promoted tweets are financially boosted tweets that allow users to target the right potential and current consumers. Promoted tweets appear in a user’s timeline only if the tweet is likely to be interesting and relevant to that user, thus increasing the chances of engagement & exposure with current & potential followers. In total 5 tweets were promoted for a month, each focusing on a different topic highlighting the importance of air purification, the Plasmaster Smoke Away, the Micro Dust Filter, the Multi Protection Filter and the importance of changing air filters resulting in a 504% increase in the number of Twitter followers.